Most people have a basic understanding of the fact that it takes a semi truck longer to stop than a normal car, yet this seems to be forgotten thousands of times every single day. So, what's the reasoning for it? Impatience? It's so tempting for drivers to speed past a trucker only to cut them off and.... wait for it...slam on the brakes! So many times a car will cut off a semi truck only to end up stopped at the same intersection as the trucker, just slightly ahead. What can be done to make this better? It's a really simple answer - leave plenty of buffer room when you pull in front of a truck so that the driver has enough time to stop. It's important that drivers understand what total stopping distance means. There's a really big difference there! We're talking a full football field vs. not quite half a football field. When you think of it in those terms it makes things very real. 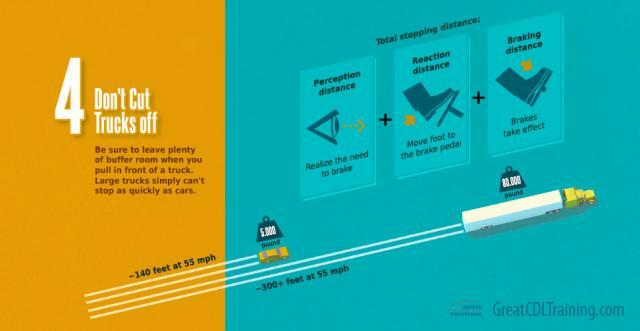 If you're mostly a car driver, what rule do you practice to make sure you aren't cutting trucks off? If you're a trucker, what do you do to make sure you don't cut off other trucks should you need to pass them? Share in the comments area below.